COMMUNITY NEWS & REVIEWS: E.S. & B. Garden Society - ANNUAL FLOWER, FRUIT & VEGETABLE SHOW. Held on Saturday last (1st) at the Village Hall in Staplecross, this was the last in the annual flower and produce shows that are hosted by this small but popular local horticultural group. LAST certainly does not mean LEAST, as the entries were all a real joy to behold and all those who participated in this village event deserve a big ‘pat on the back’ for all their stalwart efforts. Entering into this little village show could not have been easy for the entrants as not only did they first, have to battle with the unusual scorching hot weather which seemed to go on forever but many then had to struggle with the time consuming and sometimes monotonous chore of watering - be it Flowers, Fruit or Vegetables in order to gather sufficient items for their chosen classes, - then just to prove who really IS in charge here, Mother Nature send us the rain ! & boy did it rain ? But did it deter our gardening enthusiasts - not in the least, - as the quality of the exhibitions proved. A very enjoyable time was had by all the visitors who attended this show, from the comments received and the intoxicating but heavenly scent arising from all the blooms displayed, together with the smells of all those yummy home cooking entries the hall was not only a beautiful sight to see, but the scents wafting around the hall was really a wonderful reminder of what an English summer is really like. It was amazing to see just how much talent we have amongst us within our community in viewing the various dazzling floral displays, photography, the handicraft section and of course those mouth watering baking entries A goodly number of exhibitors entered the wide array of classes on offer throughout the schedule which was quite gratifying to all the organisers, both in front and behind the scenes. Trade was sure and steady at the refreshment counter with a good selection of delicious cakes and biscuits tempting the visitors and the raffle was also - as usual - a very popular draw for one and all. The results of the show will be shared with you as soon as received. Many grateful thanks must be given to the judges of the classes for giving up their time and to our local East Sussex County Councillor, Mrs Angharad Davies for coming along to hand out the trophies and Certificates to all the worthy winners. Sadly, the lists for the Class winners is not available to date, but all the results will be shared with you as soon as it’s received. All in all, another great day for this popular little garden society but especially for all those magnificent exhibitors. We’re all certainly looking forward to next year already ! ROTHER RAMBLERS: Just two (2) walks are organised this week by the members of this dedicated walking group.-both different but both delightful so choose and enjoy!. Walk No: 1 is planned for Monday September 10th and is a 6-7 mile circular stroll entitled “ All Sorts near the Coast!” The meeting place will be the sea end of Dog Hill Lane, Winchelsea Beach, near the public conveniences. OS.EXP125. TQ917161. (satnav TN36 4LK at 10.00am. This walk is part of the ‘Walk with London Blind Walkers’ event and will be a flat and leisurely walk to include seashore, Military Canal, and the Nature Reserve. The ‘walk notes state that a picnic lunch at Camber Castle is suggested with an optional tea & cakes treat at Winchelsea Beach café upon completion of the walk. The No:101 bus could be used from Hastings or Rye Station. Please check times and notify the walk leader if you are intending coming by bus.’ The ‘walk Leader, on this occasion will be Inga and you may contact her on 01424~812597 for more details. Walk No:2 is arranged for Wednesday September 12th and consists of a 9.5 circular walk of The Downs and Castle Hill Nature Reserve from Telscombe. 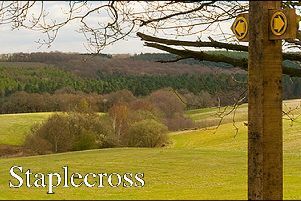 The meeting point is to be the South end of Telscombe Village. OS.EXP122. TQ403031. (satnav BN7 3HZ) at the normal time of 10.00am. The walk notes state ‘Parking - Head through Telscombe Village and up the hill. Cross the cattle grid by the “Road Closed” signs and park on the grass round on the right. There are also a few spaces on the Right-Hand grass verge in the lane - just before the cattle grid. A picnic lunch is again suggested and on this walk - Dogs are welcome to accompany you. Your ‘walk leader’ is to be Phil who you may contact on 0208~660~3545 or Mobile: 97887~635681 for all further information. STAPLECROSS BOWLS CLUB: This would appear to be the final month in the very busy fixture calendar for this enthusiastic and dedicated members of our own local outdoor bowls club. The Club have two (2) games to play this week and both are ‘at home’ fixtures. Match No: 1 is to be played on Tuesday September 11th against a team from Horam. This match will begin at 2.30pm. The second game sounds a delightful event which also incorporates a social time as this is the club’s annual ‘Candlelight Bowls’ fixture. As the club’s season slowly draws to an end, it may be the perfect time to consider if this could be the sport for you. For all further details of these matches and of other social activities which the Staplecross Bowls Club are organising, please contact them either via email: simmonssm@talktalk.net or by telephoning Brian on 01580~830570. New members will always be very warmly welcomed. EWHURST PARISH COUNCIL: Members of Ewhurst Parish Council, would like to invite you to come along to the regular monthly meeting of your local Parish Council. This meeting will take place on Thursday August 13th. at 7.30pm and will be held this month in the Herdman Pavilion, Ewhurst Green.This, like all council meetings, is open to the public, so please come along and have you say. Tell us about your concerns and talk to us about what you want to happen - or not happen - within our community. Put your questions to all levels of local government as representatives from Rother District Council and East Sussex County Council will hopefully, also be in attendance. We are always working hard on your behalf so please come and tell us how we’re doing, how we can improve, and how we can make living within this parish a happier and better place for us all. DATES FOR YOUR DIARIES: Keeping these four very important dates in ‘the public eye’ - so to speak, as they are very important events to a number of people - all with good reason. So here once more are a gentle and respectful reminder of how you can help make a difference, by coming along and taking part. DIARY DATE NO: 1 ~ STAPLECROSS BONFIRE SOCIETY: Part of the East Sussex Bonfire Society, our own local charity fundraisers are holding their annual “Grand Auction of Promises” event on Friday September 21st. look out for the notices giving more details of what’s on offer, and make sure you save this date, but further details can be had from contacting John (Publicity Officer) on 01580~831263 or Brian on 01580~830570. More information closer to the event. DIARY DATE NO: 3 - STAPLECROSS VILLAGE HALL - MAMMOTH JUMBLE SALE - Way back in the Spring, - for circumstances beyond our control, the Trustees of this much loved Village Hall were unable to hold their Annual Fund-raising event - their Spring Jumble Sale. But fear not, good folk, - a Grand Jumble Sale has been arranged and the date has been booked ! This will now take place at the Staplecross Village Hall, Northiam Road, TN32 5QG on Saturday September 22nd with the doors opening at 2.00pm. Donations can be brought to the Village Hall from 9.30am on that day, but if you can’t wait until then, or will be unable to deliver them to the village hall - then please contact either Anne on 01580~831881 or Larry on 01580~830576 who will be happy to arrange collection from you. This could be the perfect time to ‘de-clutter’ -just in time for Christmas !! !.Teas & coffees will be available throughout the afternoon with a super cake stall and raffle stand for all to enjoy. Entrance is 20p..Don’t Miss It !. DIARY DATE No: 3 - It’s that time of the year again, when the whole community come together to enjoy and support this “Coffee Morning - with a Difference” event. Up and down the country - and even across the world - people are getting together to enjoy a cuppa, a slice of cake and enjoy congenial company whilst helping to raise such necessary funds for this amazing good cause. The date to remember is Saturday September 29th. at Staplecross Village Hall between 10.00am and 12,Noon. There will also be a raffle stall and a Tombola for the lucky ones to try and perhaps other stalls to peruse. This may seem rather a long way off, but it’s such a super little event, and again for such a worthwhile cause that this is definitely NOT a date to miss ! Please contact Pauline on 01580~830570 for all further details. CHURCH SERVICES: Church services for the parish of Ewhurst will commence at St. James the Great, Ewhurst Green on Sunday September 9th. Trinity 15. at 9.30am.This service will include Holy Communion. (BCP) A ‘Morning Praise’ service at St. Marks church, Northiam Road, Staplecross will follow directly after at 11.15 am. There will be NO SERVICE today at St. Giles church, Bodiam. If there is any church matter on which you feel you may need further assistance, especially Baptisms, Weddings and sadly, Funerals, then do please get in touch with our Priest in Charge, Canon Christopher Irvine on 01580~830925. He is always there to care and support you and will unselfishly guide you towards the solution that is right for you. ANY NEWS FOR THIS COLUMN: PLEASE CONTACT ME: The summer flowers, following the recent heavy rain, cloudbursts and winds are keeping the promise of warmer and drier days to come, by lifting their heads upright and brightening our days once more, so lots of Summer time to still enjoy, as we ease slowly towards the Autumn period. Life in and around our villages and community is far from being dull or boring as we have a welter of clubs, groups, societies, sports and other activities to take part in or just to spectate and support. If you are arranging an event in the foreseeable future, --- whatever the nature of the event and however large or small, indoors or out - and you’d like some extra free coverage for it, - courtesy of the Observer Newspaper - then please get in touch. If it’s of interest to you, - it’s of interest to us. it’s never too early to send in any of the details and to tell us what you are planning. Many of you will be turning your thoughts to planning other events for us all to enjoy over the coming months, so please do contact me, as I’d love to hear from you and to help ‘spread the word’ on your behalf. ..........Thank You.